THY HAND O LORD HAS GUIDED. Isaac Thomas Steff was born in Summertown in 1849 and baptised there on 6 May. He was the son of William Steff and his second wife Martha Colcutt, who were married in Oxford in 6 November 1827: they were both then living in St Mary the Virgin parish, but that church was under repair, so the marriage took place in All Saints’ Church. Isaac’s eldest brother George was baptised at Stanton Harcourt and died at Summertown in 1849, and his brothers Edward, James, and John were baptised at St Clement’s Church in 1830, 1832, and 1833 respectively. Isaac's parents then moved to Summertown and had seven more children baptised there: Susannah Mary (1837), Charles (1838), Harriet Martha (1840), Rachael (1844), Eliza and Emily (twins, 1846; Emily died aged seven months), and finally Isaac himself in 1849. At the time of the 1851 census Isaac (2) was living at Summertown with his parents William (61), who was a gardener, and Martha (43) and his siblings Edward (20), John (17), Charles (12), Harriet (11), Rachael (9), and Eliza (7). Their eldest daughter (Susannah) Mary (14) was already out to service, working for John & Ann Wigzell in Plantation Road. At the time of the 1861 census Isaac (12) was still at school and living at Rogers Street (then named Church Street) in Summertown with his father William (71), who was still employed as a gardener; his mother Martha (53); his brother James (29), who was an agricultural labourer; and his sister Rachel (15). His father William died two years later at the age of 78 and was buried at Summertown. At the time of the 1871 census Isaac (22) was a printer-compositor still living at Rogers Street with his widowed mother Martha (72) and his sister Rachel (26), who was working as a laundress. His mother died the following year at the age of 72 and was buried at Summertown. Helen Mary Parker was born in Botley (then in Berkshire) in 1847 and baptised at North Hinksey Church on 23 May. She was the daughter of Peter Parker, a baker, and his wife Mary King, who were married in Oxford in 1844. For more about her parents, who are also buried in St Sepulchre's Cemetery, see their grave. At the time of the 1851 census Helen (4) was living in Botley with her father Peter Parker (31), who was still working as a baker, her mother Mary (30) and her sister Susan (6). By 1854 the family had moved to Summertown, and Helen’s father was working for a fishmonger. Her two brothers were baptised at Summertown Church: Joseph Townsend Parker (1854) and Percival Charles Parker (1856). By 1861 the family had moved to Russell Place in Summertown and Helen’s father was described as a fishmonger’s porter. Helen (14) and her sister Susan (16) were simply being described as being at home in the census, and her brothers were at school. In 1871 Helen (24) was working as a dressmaker and living at 2 Field View, Summertown with her parents and her three siblings. Nellie Martha Parker Steff (born at 24 Victor Street, Oxford on 30 August 1888 and baptised at St Barnabas's Church on 7 October). At the time of the 1881 census Thomas (32) was a printer and living at Church Street, Summertown with his wife Helen (33) and their children Gertrude (4), Thomas (3), and Guy (1). The family had moved to 24 Victor Street in Jericho by August 1888, suggesting that Isaac Steff was now working for Oxford University Press. 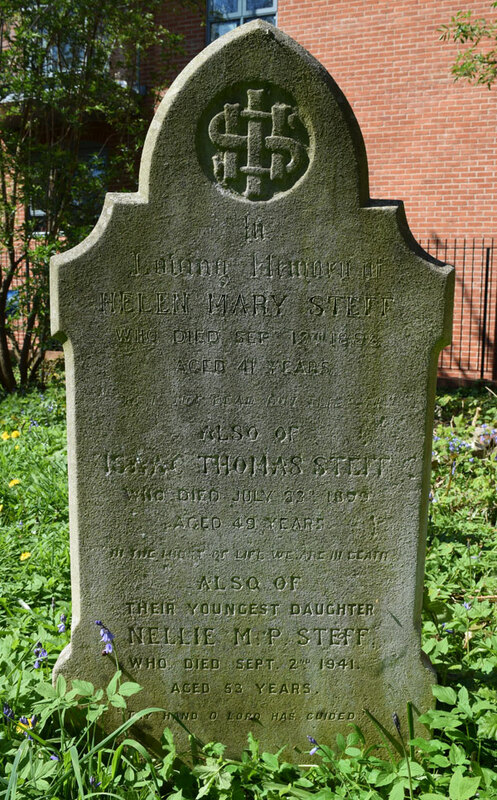 † Mrs Helen Mary Steff née Parker died at 24 Victor Street at the age of 41 on 12 September 1888 and was buried at St Sepulchre’s Cemetery on 16 September (burial recorded in the parish register of St Barnabas’s Church). At the time of the 1891 census Isaac (42) was living at 24 Victor Street with his four children: Gertrude (14), who doubtless helped keep house; Thomas (13) and Guy (11), who were still at school; and Nellie (2). They had a 64-year-old housekeeper. † Isaac Thomas Steff died at 24 Victor Street at the age of 49 on 23 July 1899 and was buried at St Sepulchre’s Cemetery on 26 July (burial recorded in the parish register of St Barnabas’s Church). Thomas (21), Guy (19), and Nellie (12) remained at 24 Victor Street after their parents’ death, but Gertrude (24) was probably already out to service. In 1901 Nellie (12) was still living at her old home at 24 Victor Street with her brother Thomas and his wife Annie and appears to have remained with them for the rest of her life. By 1911 census Nellie (22) was living in Worcestershire at 195 Cheshire Road, Smethwick with her sister-in-law Annie, who was an upholsteress; her brother Thomas was lodging in Leicester, and they all eventually moved there. † Miss Nellie Martha Parker Steff died at Leicester at the age of 53 on 2 September 1941 and was buried at St Sepulchre’s Cemetery on 6 September (burial recorded in the parish register of St Barnabas’s Church). Gertrude Marion Helen Steff (born 1877) was a general servant at River View, a large house at the top of Headington Hill, in 1901, and was working as a maid in a household at Penn, Buckinghamshire in 1911. She never married, and was living with her brother Guy at 1 Spring Gardens, Abingdon when she died at the Cowley Road Hospital on 20 June 1951. Her effects came to £719 12s. 11d. Thomas Gordon Steff (born 1878) married Annie Peake Timperley in Marylebone at the beginning of 1901. They had no children. At the time of the 1901 census Thomas (23) was working as a carpet planner and was still living at at 24 Victor Street in Oxford with his wife Annie (30) and taking care of his brother Guy (21) and his sister Nellie (12). In 1911 he was still employed as a carpet planner and was lodging in Leicester, while his wife Annie, who was an upholsteress, was staying at 195 Cheshire Road, Smethwick, Worcestershire with his sister Nellie. They all ended their days in Leicester: Annie died there in 1951, and Thomas, who was living at 113 Peter’s Road there, died at 2 Swain Street on 16 November 1958. His effects came to £1,341 3s. 10d. Guy Steff (born 1880) was a draper’s clerk aged 21 in 1901, living at his old family home at 24 Victor Street with his married brother Thomas. On 4 June 1906 at Ss Philip & James Church, Oxford, Guy Steff (26), described as a clerk of 25 Plantation Road, married Edith Ford Watkins (27) of 19 Observatory Street, the daughter of the butler Charles Watkins. They had two children: Agnes Dorothy Anne Steff (1907) and Cyril John Edwin Steff (1910). At the time of the 1911 census he was working as a mercantile clerk for a carpet manufactory and living at 62 Spring Road, Abingdon with his wife and two children. He was living at 1 Spring Gardens, Abingdon when he died at the Radcliffe Infirmary on 2 March 1953. His effects came to £1,445 12s. 5d.